Logos Bible Software is offering a free book each month in 2012. For June, you can download The Four Hundred Silent Years, by H. A. Ironside. The book can be read with either Logos Bible Software, Vyrso, or Bilbia.com, either on your desktop computer or using the Logos App for iPad or the Android. Follow the link to download the book and enter the drawing for the 65-volume Complete Works of H. A Ironsides. 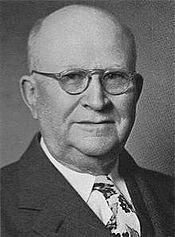 Ironside (1876-1951) was a pastor and teacher often associated with the Plymouth Brethren, although he is well-known for his evangelistic preaching throughout America. He was a visiting lecturer at both Moody Bible Institute and Dallas Theological Seminary, although he never accepted calls from either school to join the faculty. He wrote commentaries on most books of the Bible as well as a large number of short booklets and tracts. Many of his books have been republished by both Kregel Books and Loizeaux Brothers. Ironside popularized of Dispensationalism in his books and was sometimes called “the Archbishop of Fundamentalism.” He is a member of the Brethren Writer’s Hall of Fame (although I suspect this is an unofficial list). The Four Hundred Silent Years is a short book (only 104 pages) on the intertestamental period traces the history of Israel. He first treats the period from the rise of Persia through the Hellenistic period in a chapter, with an emphasis on Ezra and Nehemiah. There is a chapter each on the Maccabean revolt and the “end of the Asmonean Dynasty.” He describes the rise of the Herodians as “The Edomite Ascendancy” and close the book with a 10 pages summary of the Literature of the Jews. 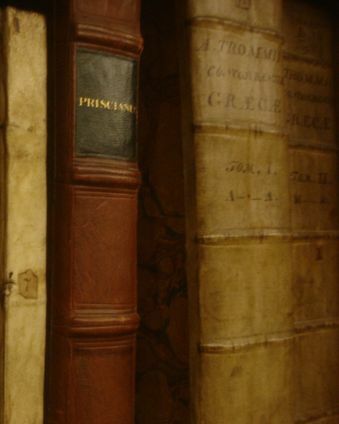 The books is written in a narrative style with very little reference to primary sources (1 Maccabees or Josephus). This will make the book a fairly easy read for the casual reader. I think that this book is interesting, however, because Ironside is described as a fundamentalist and an early proponent of Dispensationalism. He at least made the effort to understand the intertestamental period – something fundamentalists 100 years later largely ignore (or worse, consider Catholic!) This little book is therefore at least a historical artifact, although the general outline of the history he retells is not inaccurate. There are better and more “up-to-date” re-tellings of this history, but this is a decent overview of the Maccabean period. The book is free for Logos / Vyrso users, download a copy of The Four Hundred Silent Years and enter the drawing for the Complete Ironside. On May 30, 2012 I successfully defended my dissertation entitled “Messianic Banquet Imagery in the Synoptic Gospels: An Intertextual Study.” The whole experience was challenging but enjoyable. At the end of the session I was confident that the committee helped to make my dissertation better by questioning me on key arguments and forcing me to sharpen my thoughts. I now am engaged in the processing their recommendations and corrections and hope to submit a final, corrected copy by the end of the month. This has been a long process and I have learned a great deal about the process of writing and defending a dissertation. Second, it is nearly impossible to anticipate the questions that will be asked during a defense. I had anticipated about ten areas in my dissertation which I would have questioned, yet not a single one of these came up in my defense. I prepared by re-reading my document several times, jotting notes and trying to anticipate the worst. Perhaps simply re-reading the whole document would have been enough, since my examiners were not as critical of my details as they were of the overall thesis of the dissertation. I suppose everyone who has defended a dissertation has some story of an odd line of questioning, I certainly do. Third, if your dissertation has been approved for a defense, your committee should already be supportive of your project. While this does not mean you will have an easy defense, it should at least mean that you have some level of tacit approval from the examiners. No university wants to have the reputation for failing PhD candidates at the defense level. I had three examiners who had read my dissertation and approved it for a defense, and two readers who were external, one from the University and one from outside. For the most part all of the discussion during the defense was an extension on the details of my dissertation, ways in which I could make my argument stronger or extended it beyond the boundaries set by the project. Last, if writing a dissertation is like a marathon, then the defense is the finish line. I am not a runner, but I hear runners say that simply finishing a marathon is sufficient reward. There is some wisdom in this, since I met far too many people who were content to remain ABD (“all but dissertation”). A dissertation defense ought to be something of a celebration of the completion of a long academic process. On the other hand, the original messenger who ran a marathon died shortly after proclaiming victory. A fitting epitaph for a dissertation: “Till in he broke: ‘Rejoice, we conquer!’ Like wine through clay, Joy in his blood bursting his heart, he died – the bliss!” (Robert Browning Pheidippides, 1879). Several people have asked me “what’s next?” I would like to publish the dissertation in some form in the near future, although I am not sure what form that will be. I plan on spinning off a few journal articles from the project and have at least two short papers which were cut from the project which ought to make good journal articles. I am more than ready to move on what what ever is next. Introduction. This blog began in 2008 when I was teaching through Acts both at my Church and in a semester class at Grace. 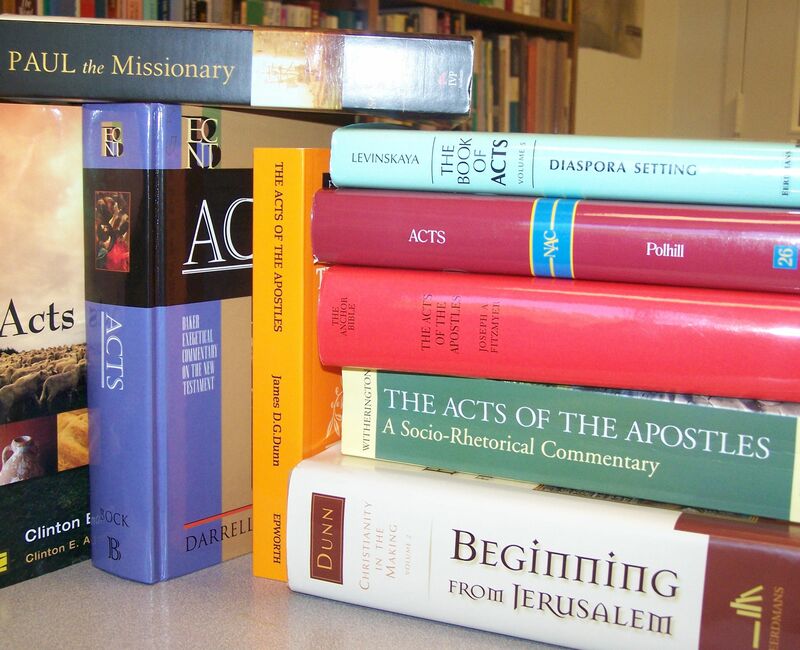 Since I have had the chance now to teach through Acts several times, I have put together a huge collection of commentaries and other resources for studying the Book of Acts. Along with Luke, there are a number of excellent monographs on the theology of Luke and Acts as well as literary studies which focus on Luke as an author. 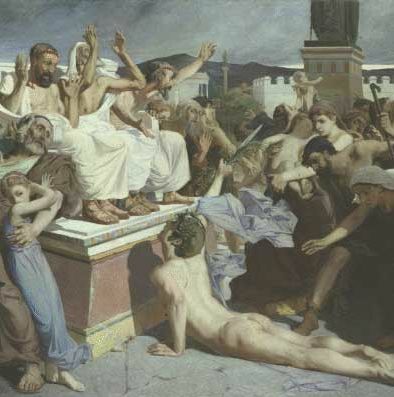 To complicate matters, the study of Acts invites historical study, especially the Greco-Roman background of the Pauline mission. I would highly recommend the five-volume series published by Eerdmans on Acts, including Paul in Roman Custody by Brian Rapske. The second volume of Eckhard Schnabel’s Early Christian Mission (IVP) is also essential for the history and background of the various cities which Paul targets as he moves west. Perhaps more than any other installment in this series so far, I have been tempted to add to my “top five.” I could easily double this list, but that is what the comments are for. I invite the readers to add a few that I have skipped here. Ben Witherington III, Acts: A Socio-Rhetorical Commentary (Grand Rapids, Mich.: Eerdmans, 1998). This commentary is one of the best for cultural background material for reading Acts and has been the “first off the shelf” for me for several years. Witherington provides some exegetical commentary, although the general reader will have no problem reading the commentary since this is not the main thrust of the book. Where the commentary excels is the massive amount of Greco-Roman material which is brought to bear on the text of Acts. As with all the Socio-Rhetorical commentaries, Witherington uses lengthy excursuses in a slightly smaller font to develop special themes. These “closer looks” are worth the price of the book alone! For example, after introducing Aquila and Priscilla in Acts 18, he provides five pages on Judaism as a religio licita. This detailed section is worthy of a major Bible Dictionary article. One of the criticisms I have of other volumes in this series is the somewhat forced use of Greco-Roman rhetorical forms, but this is not a problem here in Acts. Joseph Fitzmyer, Acts (AB; New York: Doubleday, 1997). As a companion to his two-volume Luke commentary, Fitzmyer’s Acts commentary is readable and useful for scholar, pastor or layman. The Anchor Bible format begins with a fresh translation followed by a comment on the text and then a “notes” section for exegetical detail. All Greek is transliterated and all citations are in-text. What is remarkable to me is how efficient Fitzmyer’s commentary is. He is able to cover the necessary issues in the text in a few paragraphs, despite having an encyclopedic knowledge of the Greco-Roman world! While the commentary is 800+ pages, it is not overly burdensome. For each section there is a bibliography covering secondary literature in English, German, and French. This makes the commentary invaluable for the scholar. James Dunn, Beginning at Jerusalem (Grand Rapids, Mich.: Eerdmans, 2009). This is the second volume of Dunn’s epic Christianity in the Making, so technically speaking it is not a commentary on Acts. Dunn wrote a brief commentary in the Epworth series (1996) and it appears to me that most of that commentary has been assumed into this larger book on the origins of Christianity. (There are some passages which are word-for-word the same, and a handful where significant changes have been made). I find Beginning at Jerusalem to be the most highly detailed commentary on Acts available today (pending Keener’s due summer of 2012). After 130 pages of introduction, Dunn steps through the book of Acts dealing with each pericope on an exegetical level, but much more attention is paid to historical and theological matters. Dunn’s style is not a verse-by-verse commentary, but rather a series of questions which need to be addressed in order to come to a full understanding of Acts. Each of these subsections are important, but a reader may skip over some if that particular question is not of interest. One of the features of this book I appreciate are chapters on topics which cannot be included in most commentaries. For example, chapter 30 is on Paul’s Churches. This sixty page essay on churches in the middle of the first century is excellent and will help any interpreter of Acts (or the epistles) unpack Pauline mission more accurately. The average commentary simply cannot spend the effort on such detail. John Polhill, Acts (NAC; Nashville: Broadman & Holman, 1992). This is an efficient commentary on Acts. By far the smallest on this list, Pohill does an excellent job covering exegetical details in the text along with providing cultural and historical background. The introduction is a only 50 pages, yet manages to give the reader a basic orientation to major issues for reading and understanding Acts. Most of the background material is found in the footnotes, although even these are not so copious that a casual reader will become overwhelmed. All Greek is transliterated. A possible criticism here is that Polhill did not write the NAC commentary on Luke, so there is less awareness in the commentary of overarching Luke-Acts themes. Darrell Bock, Acts (BENTC; Grand Rapids, Mich.: Baker, 2007). Bock also write the BECNT on Luke, so this commentary has the same look and feel as his previous work. Bock also has a work on the Theology of Luke / Acts due from Zondervan in the Summer of 2012. His 46 page introduction briefly covers essential issues, and while I particularly like his theology of Acts section, I look forward to more detail and expansion in his upcoming biblical theology text. As with his previous commentary, each section begins with a summary of the larger unit and a translation of the text. The exegesis section includes both Greek and a transliteration of the Greek. He deals with both lexical and syntactical issues in the body of the commentary, spending more time on identifying grammatical categories than other commentaries on this list (I think that is a DTS thing!) Unlike the Luke commentary, Bock does not have a final summary at the end of the pericope, by guess is that these were dropped by the commentary series. Conclusion. What have I left out? What commentaries on Acts have you found useful? Once again the classics are missing (no F. F. Bruce?) Let me know what I have missed! Introduction. For someone who has spent most of their academic career in the Synoptic Gospels, John commentaries are a strange and undiscovered country. Commentaries on John do not have to dwell on syntax since the Greek is fairly straightforward. Rather, a commentary on John must wade through some of the most dense theological texts in the New Testament. Sorting through John’s possible influences (Jewish, Hellenistic, Gnostic) is something of a chore. In addition, there seem to be more high-quality commentaries on John than any of the gospels. It was very hard to come up with a final five. Since I have been preaching through John, I have picked up a few more John commentaries. In fact, I would describe the last five years as a great time to be a Johannine scholar! Not only have several new and excellent commentaries been published, but Köstenberger and Marvin Pate have both published books on the theology of John and his letters. I had to leave a few off the list that I have used regularly and enjoyed. Craig Keener, The Gospel of John: A Commentary (2 Vol. ; Peabody, Mass. : Hendrickson, 2003). Keener’s introduction to John runs 330 pages, then he tags another thirty pages of introduction to the prologue. This introduction ought to be required reading for anyone who wants to seriously study John. In fact, it should probably be separated from the commentary and sold separately as a monograph on interpreting John’s gospel. His section on the Jewish Context of John’s gospel (pages 171-232) is excellent. The body of the commentary deals with every imaginable aspect of the Greek text, drawing on the Hebrew Bible as well as the literature of the Second Temple Period. A scan through his footnotes demonstrates Keener’s mastery of both Jewish and Hellenistic literature. He deals with problems of historicity as well as special Johannine features in the body of the commentary. The main criticism of this commentary is related to its strengths – there is so much material here it is difficult to digest to all. D. A. Carson, John (PNTC; Grand Rapids, Mich.: Eerdmans, 1991). This is a remarkably useful commentary on John for exegetical details. Carson states in the introduction that he does not intend to interact with all of the scholarship on John, but rather “a small representative part of the massive secondary literature on John.” In the body of the commentary he treats the Greek text well both in terms of lexical and syntactical issues. All Greek words are transliterated so the non-Greek reader will have no problem reading the commentary. Footnotes are rare, sources are cited in-text. Carson is best when he is comparing several options for understanding a text. In the end, it is always very clear what his view is! Of the five commentaries listed here, Carson is in the most likely to draw implications for systematic theology. Frederick Bruner, The Gospel of John (Grand Rapids, Mich.: Eerdmans, 2012). 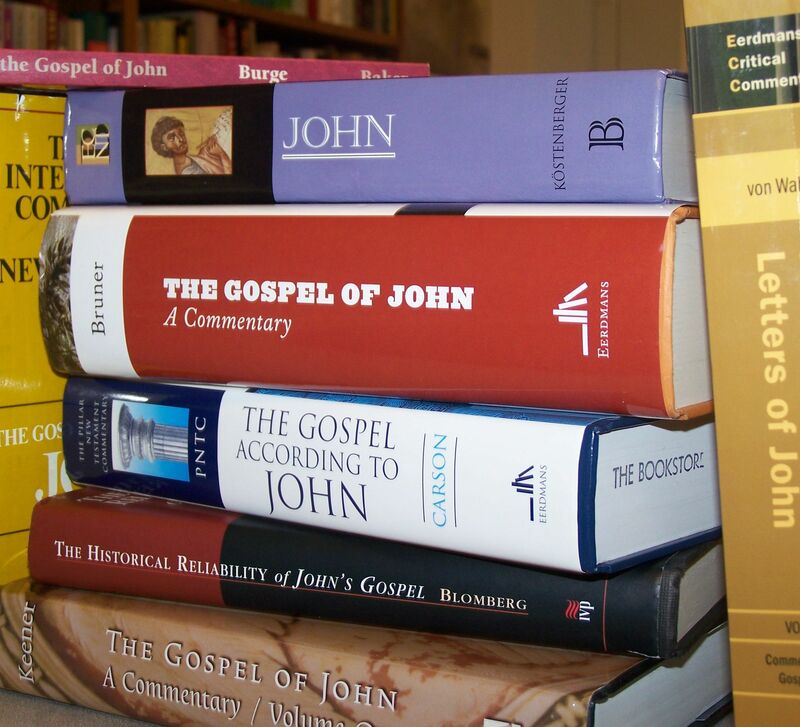 At nearly 1300 pages, Bruner’s commentary on John is a massive contribution to the study of the fourth gospel. This is not an exegetical commentary. In fact, rarely will Bruner comment on a Greek word or a syntactical detail. Where this commentary excels is in the section labeled “historical interpretation.” here Bruner gathers trenchant comments from a wide variety of interpreters, from the church fathers to modern scholars. Some of these are the usual suspects (Augustine, Luther, Calvin, Brown, Schnackenburg, Bultmann), but often Bruner cites obscure scholars or preachers, sending me to Wikipedia for a little biography. One of the things I really like about this commentary is the list of key quotes from scholars which serve as an introduction to the interpretation. These are thought provoking and focus my attention on important aspects of the text fort preaching and teaching. Craig Blomberg, Historical Reliability of John’s Gospel: Issues and Commentary (Downers Grove, Ill.: InterVarsity, 2001). This is the more brief book on this list, about a quarter of the size of Bruner. Yet this book has been extremely helpful to me in working through the book of John. Blomberg’s goal is not an exegetical commentary, but rather to assess the value of John’s gospel as a contribution to the study of the historical Jesus. Usually John is left out of discussions of the historicity of Jesus because it is assumed the book was written late by someone who was far-removed from the eyewitnesses to the events of Jesus life, as a theological document rather than historical. Blomberg wants to read the stories in John and evaluate them on a historical level. What this means is that he places Jesus in the context of the Second Temple Period, and in the end, John’s gospel is very Jewish, John’s version of Jesus is very Jewish, and the story told in John is not as a-historical as is often assumed. This book is written in a non-technical tone and can be read by scholars, pastors, and laymen, yet is a valuable contribution to the study of the fourth gospel. Andreas Köstenberger, John (BECNT; Grand Rapids, Mich.: Baker, 2004). Of the five I have chosen, I have used Köstenberger the most over the last year as I prepared for my preaching on John. For the last year, this has been my “first off the shelf” commentary, although there are more detailed commentaries available. Like most of the BECNT series, each pericope begins with a synopsis of the section followed by a translation and exegesis. He deals with lexical matters int eh body of the commentary, syntactical issues tend to be placed in footnotes. Textual critical comments are covered (briefly) in the “additional notes” at the end of a pericope. Köstenberger’s commentary is excellent for its interaction with other literature on John. The footnotes are packed with detailed notes drawn from a wide variety of scholarship. Köstenberger does not have a conclusion to each pericope to draw out theological implications, this is done in the body of the commentary where necessary. For the most part, the theological results of his commentary are to be found in his Theology of John (Grand Rapids, Mich.: Zondervan, 2009). Conclusion. What have I left out? What commentaries on John have you found useful? I have included no classic commentary on my list – let me know what I have missed! Introduction. Scholarship on Luke and Acts tends to focus on Luke as a Historian (since that is how he presents himself in the prologue), but also on Luke as a Theologian. In the ancient world, these two discipline would not have been as separate as they are today. Perhaps this is just my perception, but there are far more monographs on the theology and literary style of Luke and Luke-Acts than the other Gospels. Luke commentaries tend to be the place where scholars work out the details of the synoptic problem with respect to Q, the sayings source used by both Matthew and Luke. In fact, occasionally you will see passages in Luke referred to as Q. An additional complication with Luke commentaries is that the are often linked with Acts. The theology of Luke-Acts must be considered, since the two books are linked. Joel Green, The Gospel of Luke (NICNT; Grand Rapids, Mich.: Eerdmans, 1997). Green’s commentary on Luke in the NICNT series represents something of a renaissance for that series. The earlier contributions were good, but not as highly detailed this excellent commentary. Green’s commentary replaces Geldenhuys’ in the series. The commentary is primarily based on English, lexical and syntactical details are found in the footnotes. This makes for a very readable commentary and one that will be the “first off the shelf” for me for years to come. One aspect of this commentary which I appreciate are the short excursus-style sections which focus on Greco-Roman backgrounds. These are in a smaller font which might imply they can be skipped – but these sections are excellent! Green is now the general editor of the NICNT series, following Ned Stonehouse, F. F. Bruce, and Gordon Fee. Darrell Bock, Luke (2 Vol. ; BCNT; Grand Rapids, Mich.: Baker, 1994). Bock’s commentary on Luke was one of the first offerings in the Baker Exegetical Commentary on the New Testament and is an extremely useful commentary for preaching and teaching. Each section begins with a few paragraphs of summary followed by a section entitled “Sources and Historicity.” Here Bock deals with “historical Jesus” issues as well as how Luke handled his sources (Mark, Q, “special sources.”) These sections are not long, and I find his comments on Luke as a historian helpful. After the sources is the exegesis proper, beginning with fresh translation of the text. Greek words and phrases appear with transliteration. More technical matters are relegated to the “additional notes.” Each section concludes with a “summary,” drawing out the contribution of the pericope for the overall theology of Luke. I have used several volumes in this series and have found them stimulating, but I find myself frustrated with the combination of in-text citations and footnotes. While it is not particularly distracting, I do not like the use of gray-scale boxes behind some sections of the text. Joseph Fitzmyer, Luke (AB; Garden City, N.J.: Doubleday, 1981, 1985). This two volume work on Luke is worthy of the adjective “magisterial.” Like other volumes in the Anchor series, the commentary section begins with a new translation of the pericope, followed by phrase-by-phrase commentary on the English text. Here Fitzmyer deals with redactional matters as well as the overall theology of Luke. In the “notes” section he goes back through the text dealing with textual criticism, lexical, syntax issues. All Greek is transliterated. Each pericope concludes with a bibliography which includes a wealth of German and French scholarship. Fitzmyer is an expert in the literature of the Second Temple Period, the Dead Sea Scrolls and Aramaic as well the New Testament. These interests appear frequently in the commentary and he suggests possible Aramaic words / phrases which may lay behind the Greek. François Bovon, Luke 1 (Hermenia; Minneapolis: Fortress, 2002) and Luke 2 (Hermenia; Minneapolis: Fortress, 2012). Bovon is one of the major lights in the study of Luke, anyone who does research on the gospel of Luke would do well to read the essays collected in Luke the Theologian: Fifty-Five Years of Research (1950-2005). Bovon’s full commentary is not yet complete. Luke 2 will cover the travel narrative (9:51-19:27) and is due out this year, the third volume is planned with no date announced. The Hermenia series is a bit different than most, beginning with an unusual book size. I. H. Marshall, Luke (NICGT; Grand Rapids, Mich.: Eerdmans, 1978). It is hard to believe that I am including this volume as a “classic,” but the fact is that it is already 34 years old! The commentary has very little introduction, Marshall simply tells the reader to read his Luke: Historian and Theologian (which was one of the first books I read on Luke and Acts when I was a undergraduate student). Marshall assumes that Luke used Mark although there is more skepticism for Q. In the body of the commentary he assumes Q’s existence frequently. Since this is a Greek text commentary, Greek words are given without transliteration. Marshall tends to be more interested in lexical matters than syntax. All sources are cited in-text (there is not a single footnote in the book), making for difficult reading at times. Marshall frequently makes used of rabbinic sources to illustrate the text, something which I appreciate although I wonder about the dating of the citations. Conclusion. What have I left out? 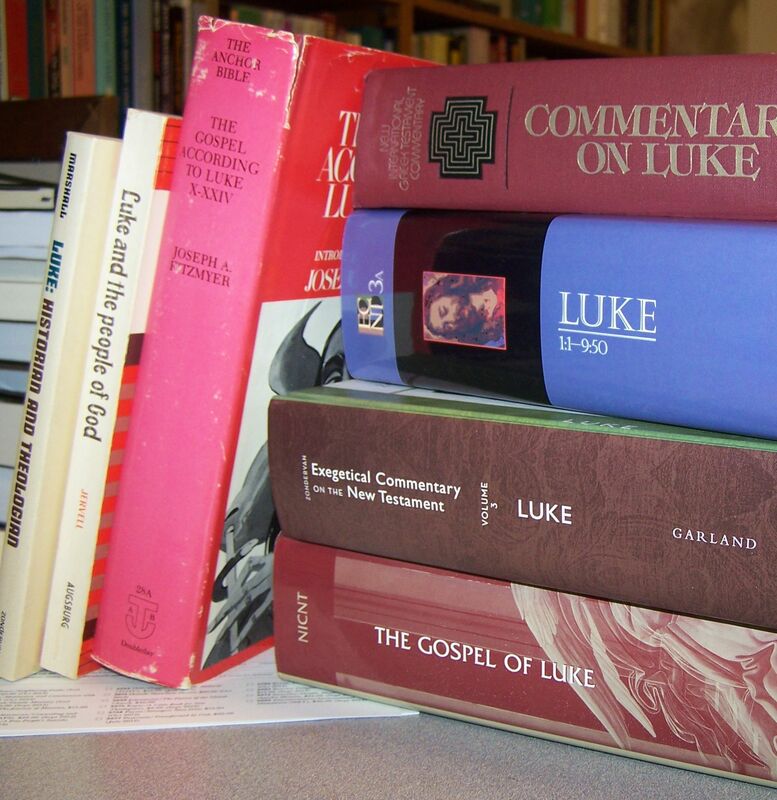 What commentaries on Luke have you found useful? What classic commentary on Luke should be read by all students of the Gospels? Let me know what I have missed! R. T. France, The Gospel of Mark (NIGTC; Grand Rapids, Mich: Eerdmans, 2002). As with all the writers in the NIGTC series, France is an expert on the Greek text of Mark. The commentary has less background material that Evans, but is rich in exegetical detail. That is not to say that France is ignorant of the Hebrew Bible or other Second Temple Period literature, but only that his main interest is the Greek words in the context of Mark. France surveys the synoptic problem briefly, giving quite a bit of weight to John Robinson’s theory of cross-fertilization. In the end France concludes “I do not need a solution to the synoptic problem.” He approaches Mark as a storyteller who has created a long narrative in three “acts.” Like many commentaries on Mark, Peter’s confession in chapter 8 is the clear turning point of the book, dividing France’s first two “acts,” Galilee (1:1-8:21) and On the Way to Jerusalem (8:22-10:52). The third act in the drama of Mark at Jerusalem, beginning in Mark 11. Craig Evans, Mark 8:27-16:20 (WBC; Nashville: Thomas Nelson, 2001). Evans finished the Mark commentary for the Word series after Robert Guelich died unexpectedly in 1991. Guelich’s commentary is excellent, but Evans’ work is even better. The commentary follows the general pattern of all WBC volumes (bibliography, translation and text, form and structure, commentary, explanation). Although Evans is contributing to a commentary begun by another scholar, he has included a 63-page introduction to Mark which covers a number of issues not covered in Guelich’s original commentary. Evans only briefly comments on typical introduction issues, preferring to up-date and extend the original introduction. His section on the theology and purpose of Mark is excellent. But what sets this commentary apart from the rest is Evans’ use of Second Temple Period literature to illustrate the world of historical Jesus. For example, his comments on the Parable of the Vineyard provides references to several rabbinic parables which may be considered as parallels Jesus’ own parable. The section of Jewish divorce practices is brief, but contains a wealth of secondary material (p. 84-6). Bibliographies for each pericope are extensive, there are five pages for the Parable of the Wicked Vineyard tenants! Robert Gundry, Mark: A Commentary on his Apology for the Cross (Grand Rapids, Mich: Eerdmans, 1993). Unlike his original Matthew commentary, Gundry’s Mark commentary is more focused on the text of Mark alone. This would have to be the case given his interest in Matthew as an editor of Mark, there is no real “redaction criticism” possible for Mark. The result is an exegetical commentary which is sensitive to the text and aware of the broader theological issues at stake. What sets this commentary apart from the rest is the “notes” section for each pericope. In the main commentary section, Gundry makes scant reference to other scholars, he simply lays out the meaning of the text. After his section, he includes a section of “notes” in which he surveys the opinion of virtually every modern scholar on the topic at hand, including major German and French scholars. The type is smaller in these sections and he cites his sources only briefly, making these sections dense but rewarding. James R. Edwards, The Gospel According to Mark (Grand Rapids, Mich.: Eerdmans, 2002). Edwards’ commentary is in the Pillar series, edited by D. A. Carson. While the series is designed for pastors, most of the volumes will have an appeal to scholars as well. Edwards has an excellent introduction to the gospel of Mark, the highlight is his discussion of Mark’s Christology. Since the commentary is aimed at pastors, Greek is transliterated and text-critical issues are relegated to footnotes. I especially appreciate his use of the Hebrew Bible and other Second Temple Period literature. The result is a very readable and useful commentary which will serve the busy pastor well. I will mention one other classic commentary here, even though this violates my “top five commentary” rule. Henry Swete’s 1902 commentary on the Greek text of Mark is available from Google Books (now, Play Books) as a free download. This is an oft-cited classic commentary on Mark which is well worth consulting. Conclusion. What have I left out? What commentaries on Mark have you found useful? 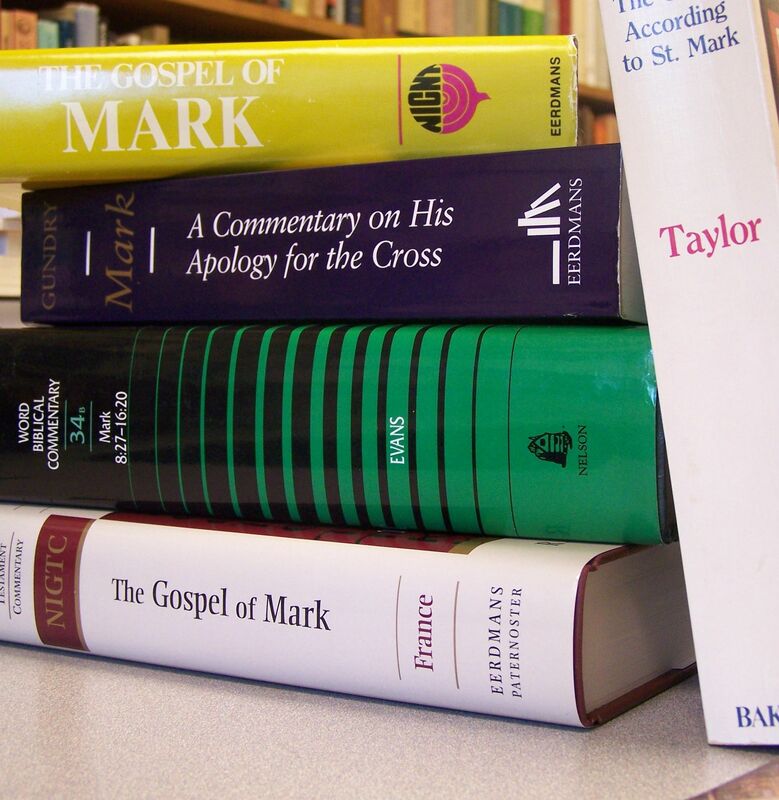 What classic commentary on Mark should be read by all students of the Gospels? Introduction. Matthew Commentaries necessarily must deal with the synoptic problem. For the most part, virtually every modern commentary accepts Mark as the first gospel written, Matthew used Mark as a foundation for his later work, usually supplemented by a sayings source (Q). Very few commentaries written in the last 50 years have attempted to argue Matthew was written first. The synoptic problem is always looming in the background of Matthew commentaries, some will dwell on it more than others. To me, over-interest in redactional issues distracts from the usefulness of a commentary. John Nolland, The Gospel of Matthew (NIGTC; Grand Rapids, Mich.: Eerdmans, 2005). This commentary is on the Greek text of Matthew and is another magisterial commentary. For Nolland, Matthew is based on Mark and Q and was composed before the fall of Jerusalem in A.D. 70, although he does not think that the apostle Matthew is the author of the final form of the book. The body of the commentary includes brief bibliographies for pericopes, comments on text critical issues, and phrase-by-phrase comments. Greek is normally translated so that a reader without Greek can use the commentary without too much difficulty. It is the style of the NIGTC commentary series to use a smaller type for detailed which may be less important, although I find these sections excellent. Nolland does an excellent job setting the words of Jesus into a Second Temple Period background, his footnotes contain copious references to the literature of the first century. Craig Blomberg, Matthew (NAC; Nashville: Broadman & Holman, 1992). I have always enjoyed reading Blomberg, his work on the parables is one of my favorites. His commentary on Matthew is the most brief of the five I have listed here (432 pages), but Blomberg has a knack for unpacking a text with brevity without sacrificing depth. His footnotes interact with a wide variety of scholarship. He argues for apostolic authority and an early date (A.D. 58-69) for the gospel. He is certain that there is some literary relationship between Matthew and Luke, but is not dogmatic on the synoptic problem. Craig Keener, The Gospel of Matthew: A Socio-Rhetorical Commentary (Grand Rapids, Mich.: Eerdmans, 2009). This is the most recent of the commentaries I have chosen and is part of a series published by Eerdmans which attempts to read the biblical books against both a social and rhetorical background. What this means is that the commentary works hard to place Jesus in a proper context (Second Temple Period Judaism) but also to place Matthew as an author in his (later) context. In fact, Keener is “more inclined to accept the possibility of Matthean authorship” than in his earlier work on the Gospel (p. 40). The gospel was written in Syro-Palestine in the wake of the Jewish War, and “within the range of” develop rabbinic influence. Keener therefore reads Matthew as a Jewish Christian voice responding to the tragedy of A.D. 70. One of the advantages of the Socio-Rhetorical series is the use of Excursus to treat issues which are outside of the normal scope of a commentary. For example, Keener has more than 3 pages on demons and exorcism in the Greco-Roman word, a section dense with primary sources. These excursuses are the highlight of the commentary. Donald Hagner, Matthew (WBC; Dallas: Word, 1993, 1995). Hagner’s contribution to the Word Biblical series follows the pattern of the whole series. Each pericope begins with a detailed bibliography, followed by a translation with textual notes and a form / structure section. It is in this section that Hagner treats synoptic issues, leaving the commentary to a detailed examination of the Greek text of Matthew. Greek is not transliterated or translated, making the commentary less accessible for those without Greek. Hagner uses the literature of the Second Temple Period as the context for Jesus as a teacher. The Word series concludes each pericope with an “explanation,” usually brief reflections on the contribution of the section to the overall theological themes of Matthew’s gospel. My suspicion is that most pastors will skip over the details and read only the commentary and explanation sections. Perhaps Hagner’s introduction to the gospel the best of the commentaries surveyed here. Conclusion. After writing this essay, I realize now how difficult it is to limit myself to five commentaries, not to mention trying to summarize a thousand word commentary in 150 words. I can think of another five which are work of a “top commentary” list and there are several classic commentaries which it pained me to omit. So tell me, what commentaries have you found useful (and why)? Who has been (criminally) omitted from this list? What classic commentary on Matthew should be read by all students of the Gospels?